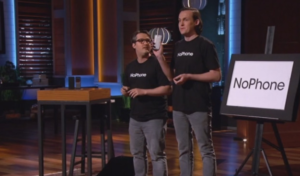 Before marketing the NoPhone on the Shark Tank, Van and Sheldon sold an impressive 3100 units. They also launched a successful Kickstarter campaign in 2014 which raised triple the goal. In addition to that, they’ve also done a TEDx Talk. Would the Sharks buy into their proposed goal of changing the world one phone addiction at a time? Let’s take a look. In their audition video, Val and Sheldon introduced themselves. They said that the real problem with society today is that people use their phones too much and are not paying attention to each other. They said that they were working at an ad agency in New York City. They said that they saw people always staring down at their phone screens at restaurants and parks . They said that they were guilty of it too. The video flash to a scene of Val and Sheldon at a bar, where they were having a conversation. Shelton’s phone started to ring, and he reached down to answer it, interrupting the conversation that they were having. Val said that that’s when he realized that it was a huge problem that they need to fix. Val insisted that they had a new product that actually worked. Sheldon said that he could see the fun of phone dependency, but with their product anyone could work past it. They stated that they put their idea online, and received a bunch of emails from people who wanted to invent their own dependency on their phones. Sheldon said that they could put NoPhone in the hands of millions of Americans this and make money in the process. The scene ended with Val and Sheldon taking a selfie in Central Park. Van Gould and Chris Sheldon walked out onto the Shark Tank, both seemingly immersed in their phones. They did not look up as they introduce themselves to the sharks. Still looking down at the phone, Van said that they were seeking $25,000 in exchange for 15% equity in their company NoPhone. Sheldon stated that there is a huge problem in the world right now, and it was called phone addiction. They both put down their phones and faced the Sharks. Mark Cuban smiled. Van told the Sharks that they read a study which suggested that most American adults have their cell phones with them at least 22 hours out of every twenty-four. Sheldon said that people were driving, sleeping, and going on dates with their phones. Robert laughed at this. Van said that some people couldn’t even look stop looking at their phones even when they’re on TV. He revealed a picture of all the sharks on the Shark Tank looking down at their phones. This got a hearty round of laughter from all of the sharks. Both of the entrepreneurs stated that they had the solution to the phone addiction problem. Van revealed the NoPhone. Lori and Mark both very confused. Sheldon explains that it’s a fake phone for people who are addicted to real phones. Van said that has no screen, battery, or apps. Sheldon explains that you use it by picking it up, holding it, and that’s it. He said that there’s no warranty, no returns and it’s not intended to be used for anything. It’s just the pet rock of the millennial generation. The Sharks laughed, but I wonder if they thought that this was a waste their time. Van and Sheldon started to hand out samples. Van gave Robert a NoPhone with the selfie upgrade, which was just a mirror. Lori asked the two entrepreneurs how many NoPhones they’ve sold. She sounded amused. Van told her that they had sold 3100 units since they started in November the year before. He said that most of the people who bought them bought them with the selfie upgrade. Kevin looked angry. He asked the two if they were serious. Van told him that they were and that they had about $42,000 in sales since they started. Robert seemed impressed. Lori and ask them how much it cost at retail value. Van told her that it was $12 for the regular NoPhone with no frills, and $18 for the new phone with the selfie upgrade. Which, again, was just a mirror. Mark asked how much it took for them to make each unit. Van explained that the cost to make it is $2.95. Daymond asked them where they had sold the units, and Van said that they sold them entirely on their online store. Mark wanted to know how they had come up with the idea. And told him that they were at a rooftop bar with friends, and they were all staring at their phones, and so is everyone else at the bar. Van said that he thought that it was crazy that they were unable to put their phones down at any point in the day, so they created the product and website, and the idea blossomed from there. It caught on fire early. Many people bought them as gag gifts. Kevin told them that it was a cute idea, but ultimately it had no value. He felt like he was in some sort of alternate universe where products didn’t have to bring value to the customer. Mark said that while he was diatribe in, he was going to be checking the messages. Mark looked at his phone. Kevin laughed. Van insisted that the two could make NoPhone a much bigger thing with the shark’s investment. Daymond asked if they had tried going to a Spencers, or another gift shop like that. Van told him that they hadn’t done much of that since they both have full-time jobs. Van said that he was willing to admit that they weren’t real sales people. Kevin laughed and sarcastically stated that they would never know it by looking at the numbers. He told them that they made literally hundreds of dollars. Robert asked if they made most of their money from it being marketed as a gag gift. Van said that that was the case. It was one of the ways that they were looking at it. Daymond asks them if they had a patent on the new phone. Van told him that they had applied for a provisional patent. Mark looked shocked. Van then explained that he was serious. Mark told them that the only thing that he hated more than people looking at their phones was dumb patents. He said that a patent on a block of plastic was super stupid and he went out. The two entrepreneurs thanked him for his time. Sheldon said that everyone knows someone that is addicted to their smartphone. Lori stated that there was a motivational poster with the cat that said hang in there. She stated that in this case, the cat needs to let go. She laughingly said that there is no way that she was going to invest, and she went out. Kevin stated that she was being cruel. Van appealed to Robert, and Robert said that he thought the idea was ingenious. He said it was good that they had sold 3,100 units, but he was afraid that that was the entire market for NoPhone. Lori nodded. Sheldon explained that that was only in one store, their website. Van asked him to imagine if they did more sales and marketing and perhaps on an infomercial. Lori told them not to invest any more money in this terrible ideas. Van told her that they had not invested at any actual money in it. Robert went out. The two awkwardly looked at the rest of the Sharks. Daymond apologized but said that he would feel stupid investing in-the-know phone. Kevin asked if he was saying that it was poo poo on a stick. Daymond stated that he didn’t want to say that about anyone’s business. Daymond said that it could be like the pet rock. He still went out. Kevin told the parents that it didn’t matter if the pet rock made a bunch of money and it was still poop. 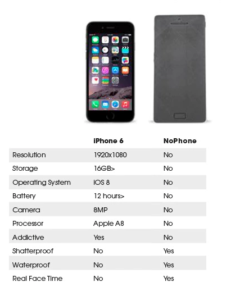 The NoPhone was the same thing. Sheldon said that the best thing about the new phone is that it’s sold 3100 units and the product was virtually nothing. Kevin told them the product wasn’t essentially nothing – but it was nothing. Sheldon was not deterred. He said that they had managed to sell nothing 3000 and 100 times. Kevin stated that it was atrocious, and he went out. As Van and Sheldon walked off the stage, Kevin checked his hair in the selfie upgrade version of the new phone. Van, in his exit interview, told the camera that the Sharks missed a tremendous opportunity to invest. He insisted that it was the pet rock of their generation and not just a piece of plastic. He claimed it would be a revolution. Let’s see how that worked out for them. The NoPhone was featured on the Forbes website, in an article about the first “fake phone company to appear on Shark Tank.” The NoPhone website is still going strong, and the company has a bunch of awesome quotes from various reviews from big companies like TechCrunch on their landing page. Time Magazine call the NoPhone “a simulation of your comfort object, helping you to slowly abandon it. The website now offers the NoPhone Air, which is just an empty plastic package, for only $5! That would be a great gift for your loved ones this Christmas, if you like being the black sheep of the family. You can also purchase all of the models on Amazon Prime, as well as the official NoPhone t-shirt. Beat your cellphone addiction today by visiting their website. This article doesn’t explain anything. Has the NoPhone racked up sales? Have they decided to shut shop? What is the status of NoPhone in 2017?